This is something that suffer from on a daily basis, I want this blog to be a place where people can relate to me and the best way of doing that is sharing even the sensitive parts of my life. Friday Health topics will be a continued topic. I hope you enjoy, In doing this my goal is to not just reach people who suffer, but to the family and friends of the people who go through these things. Its usually very helpful to have educated people around you, or for someone who doesn't understand what their friend or family member is going through. Today's Topic is Social Anxiety. Every day life is filled with, Fear, Apprehension, Avoidance and pain. As many others i often find myself worrying about others disapproval. I often find myself afraid of not fitting in. Being rejected by my peers. I'm constantly putting up a defensive wall. 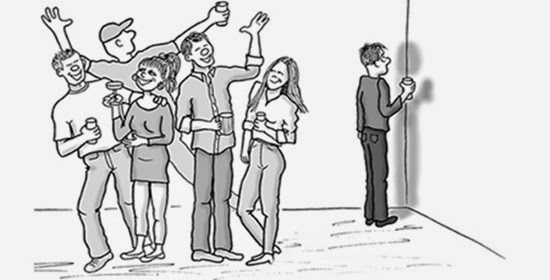 Very few people understand the agonizing and traumatic depth that the social anxiety brings, it makes people try to protect their secret, most people try to hide it from friends and family. Often fearing that their loved ones will see them differently, or not fully understand what is truly going on. An example of what its like to have social anxiety. When I go grocery shopping I hate standing in line, I often feel like everyone is watching me, I know that its probably not true, as I get closer to the check out person, I find myself sweating a fidgety that this person is going to be concentrating on me. I'm scared that all that will come out of my mouth will be gibberish. my anxiety will go through the roof. Unlike other psychological problems, social anxiety is not well understood by the general public, or even by medical and mental health care professionals. People with Social Anxiety are misdiagnosed almost 90% of the time, some people have often been misdiagnosed as having Schizophrenia, Manic-depressive, clinically depressed, panic disorder and/or personality disorder. Social anxious people usually never hear of their disorder being talked about on television talk shows, they think that they are the only ones that have the symptoms, therefore making them quiet about what they are going through. 1. Avoiding situations where you may feel like you are or will be the center of attention. 3. Considerable fear of being in situations with strangers. 1. Environmental Stress: Work pressure, personal relationship problems or even financial problems. 2. High Altitude: Hypoxia (lack of oxygen) can also be the trigger of Social anxiety. 5. Substance Abuse: Street drugs in general. How can social anxiety be treated? There are many places that you can find peer help such as forums and facebook pages. Please note that they might not be for everyone. I found that some of the facebook pages I joined were more based on people posting selfies and not offering much help in the anxiety portion. It will take a couple groups to find what one works best for you. If possible look for a local group in your area. I found that joining these sites/pages helped me realized i wasn't alone and i found myself offering help to others through my experiences Below are some forums that you might find helpful if you have Social anxiety, or even if you are trying to understand more.. If you see a page that is amazing and has helped you or anything you would like to add, please leave a comment below. I remember having anxiety when I was in my first year of college. I just leaned on the support from my sister who went to the same school and got through it. There are so many people affected by this and they don't realize there are ways to help it. Thanks for the informative post! I am glad you are here to help others talk about things and hope you find the help you also are looking for as well. Thanks so much for sharing your struggle. I know many people suffer in silence because they feel like no one out there will understand them. I really love this post. I think it's so great that you're sharing your personal struggle with social anxiety. I hope all the positive comments I'm sure you'll receive lift your spirits. Thanks so much for giving us an insight to your life and your struggle. It's so great to see someone sharing their story to help someone else. This is such a great post. I suffer from anxiety and these are great tips. Thank you! Great great information. SO many people are affected by this! I have gone through different forms of anxiety on and off throughout life. Thank you for sharing this with everyone! It is not a topic many people understand, nor one a lot of people want to talk about. Oh I think its great that you are sharing this on your blog because it could really help someone else. You are brave for doing so! I was diagnosed with this years ago. I was always told to face my fears. As I get older it is something I feel has improved for me. This is a great topic because there is so many out there. Thanks for sharing. I can only imagine how bad social anxiety can be. I suffer from a panic anxiety disorder. However I end up having panic attacks because of thoughts of impending danger. It could be something as simple as having to walk into an unfamiliar room and my mind starts thinking about how I am going to get out if it catches on fire. I have to know my come up with an exit strategy and then that just spirals out of control to a complete anxiety attack. I always feel silly trying to explain what my triggers are because they can be everything/anything. Pretty blog ... Killer Powerful blogpost that needs a lot more attention. Well Done. I HAVE THAT!! it's bad. i get REALLY moody in large crowds or when there's too many people around. i hide in the corner and feel like crying, then people get mad at me for not being social. Oh it's a bad time all around. Which is why I really never leave my house. EVER! I suffer from extreme social anxiety and I hate social situations. I hate crowds, stores, talking to people on the phone, ordering food at the restaurant, and any time I am expected to talk to someone. Thanks for the info and for being so open. There are so many people with this issue and won't even acknowledge it. I know a couple of people who suffer from this, it really hinders them on doing the things that they would like to do. What an informative article. my nephew has pretty bad social anxiety, so I will be passing this on to his mother. i think i have this on occasions but there is nothing a big smile + a positive attitude cannot overcome, right? I used to HATE going out by myself. I'd look and envy those going to restaurants, the mall, or movies by themselves. The thing that got me through it... I can spend QUIET time doing so, go where I want to go without waiting on others, and hey, everybody's doing it. Haha. It's scary when mis-diagnosis comes into play. That can lead to medicines people don't need and still leave the actual problem untreated. I have a fear of being criticized especially on my weight issues. I'm fat when I was in high school, I've slimmed down to the desired weight that I wanted but there are times that I want to eat a lot but I'm thinking of gaining weight so I became so anxious and depressed. Anxiety is tough. It is hard, but helps to know that you are not alone. Anxiety is a hard thing to control. I despise social situations, but I keep forcing myself into them because it makes me uncomfortable. I still run and hide in my room a lot, but at least I'm pushing myself a little bit. I have never experienced this, but I know many good people who have and I try to be respectful and caring. It's okay to be who you are and you should be encouraged as such! Thank you so much for this post! I love that their is increased awareness and acceptance of mental health issues!